Today I went for a fish in the Haughton with forum member Jake (snake). There has been a lot of discussion on the forum recently about the new Threadybuster range of lures, and Jake has been one of the more successful users. I have never used one and was keen to see what all the fuss is about. I don't yet own a Threadybuster, so I had to borrow one from Jake of the day! Thanks mate! We left my place about 5am and arrived at the ramp a little too early with first light only just starting. So initially we didn't venture too far, just to a deep section of bend downstream of the ramp. There were some good shows in the sounder in open water around the 3-4m range. This is ideal country for the threadybuster as they are fast sinking and not particularly snag proof. 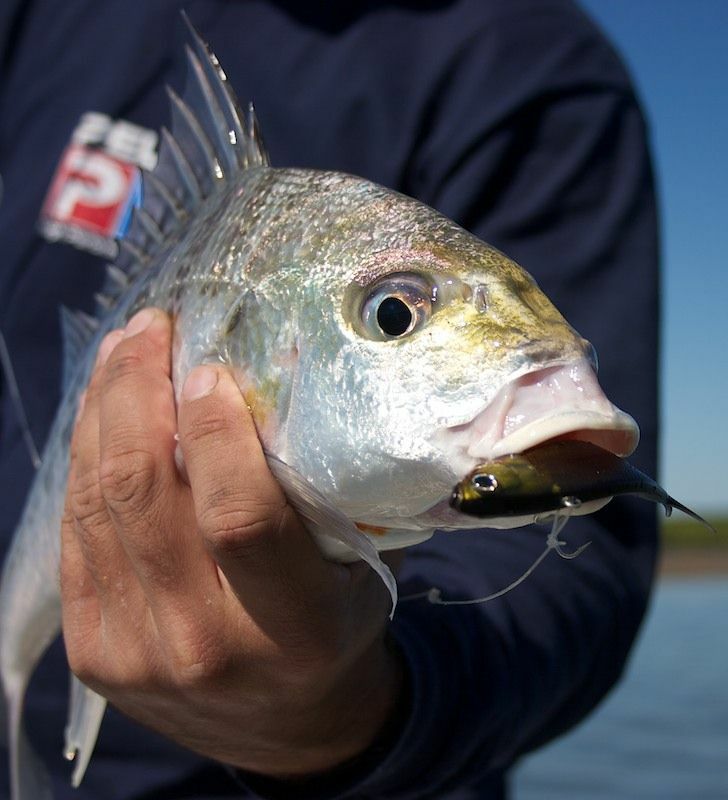 The technique was to drift with the current, making long casts back upstream working the lure back toward the boat. 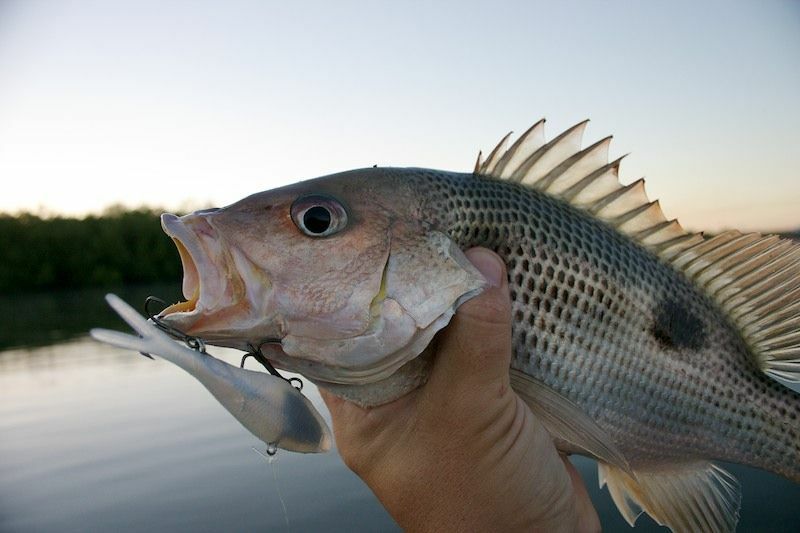 The lure is allowed to sink to the bottom before a couple of quick snaps of the rod to lift it off the bottom. It then sinks again before repeating the process. It didn't take long and we were both getting taps on the lure on the sink. Then finally decent fish connects to my lure and takes off with a few powerful surges. It had us guessing for a moment, but turned out to be a nice little creek GT. We kept working the area and managed a whole host of species including GT, Salmon, Jack, Fingermark, Grunter and Queenfish. 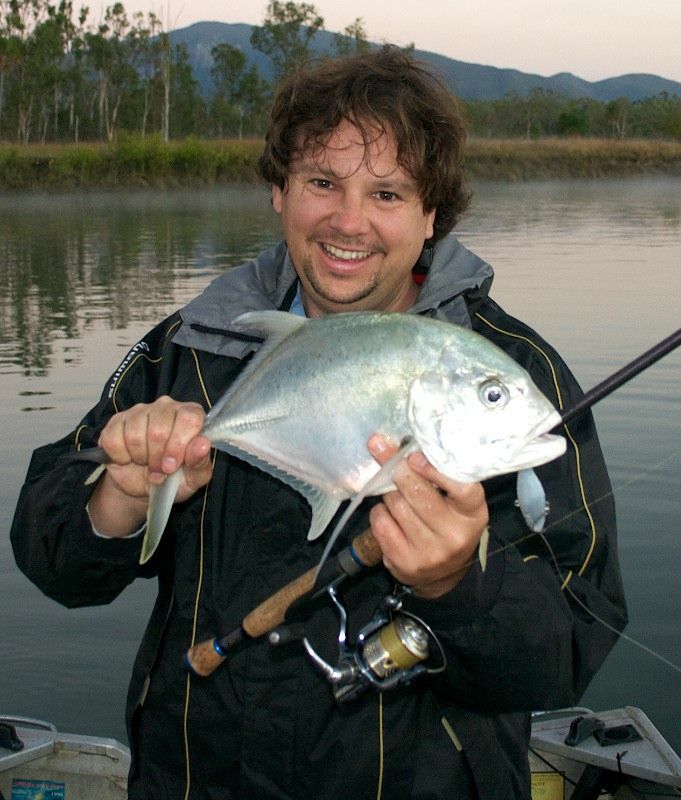 In fact, we had caught quite a few fish before we even landed 2 of the same species! Once the sun came up we swapped over to some more snag-proof lures and headed upstream to work into the timber. 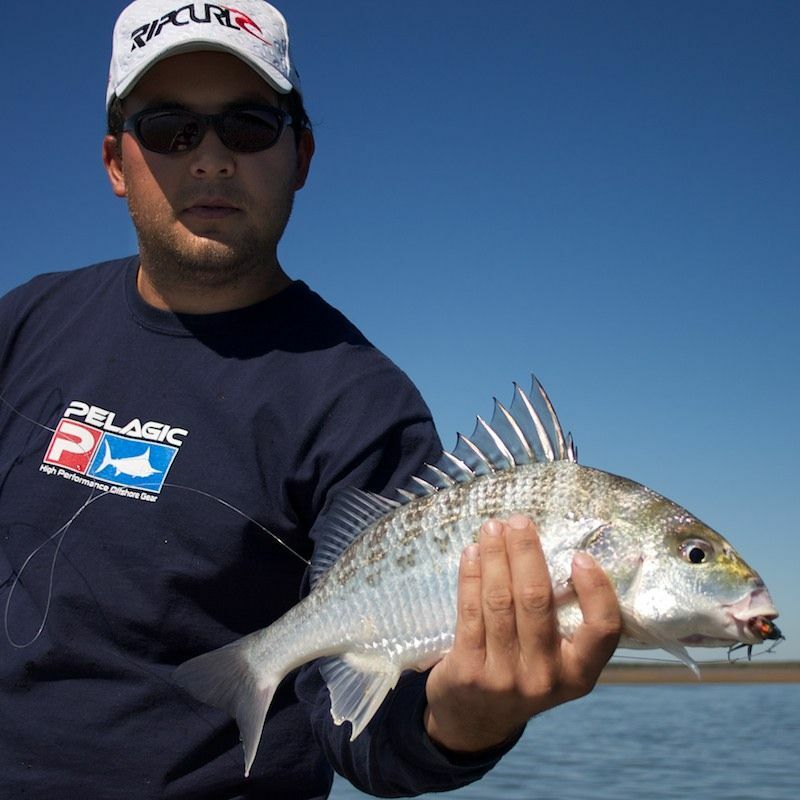 I changed over to a trusty prong and Jake worked an assortment of hard-bodies and plastics including the D.O.A prawn. The action wasn't thick, but came in bursts of fish. 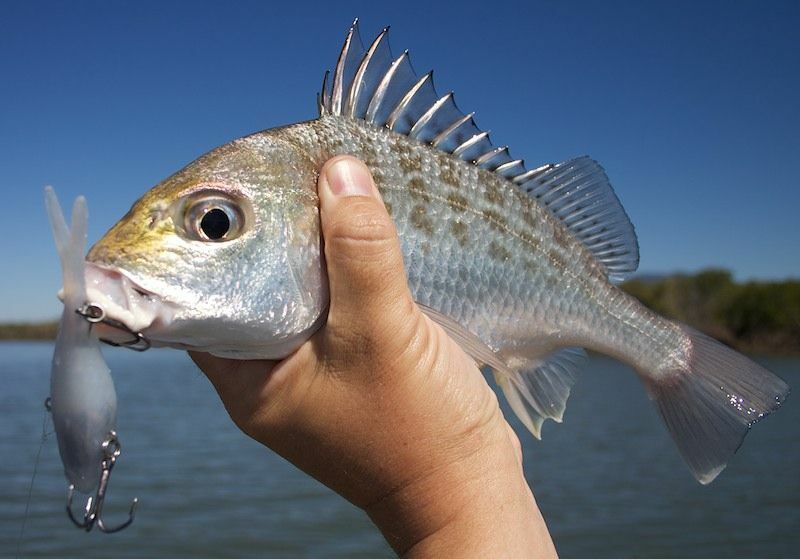 We managed a few small fish including Bream, Flathead, Jack and Rat Barra. 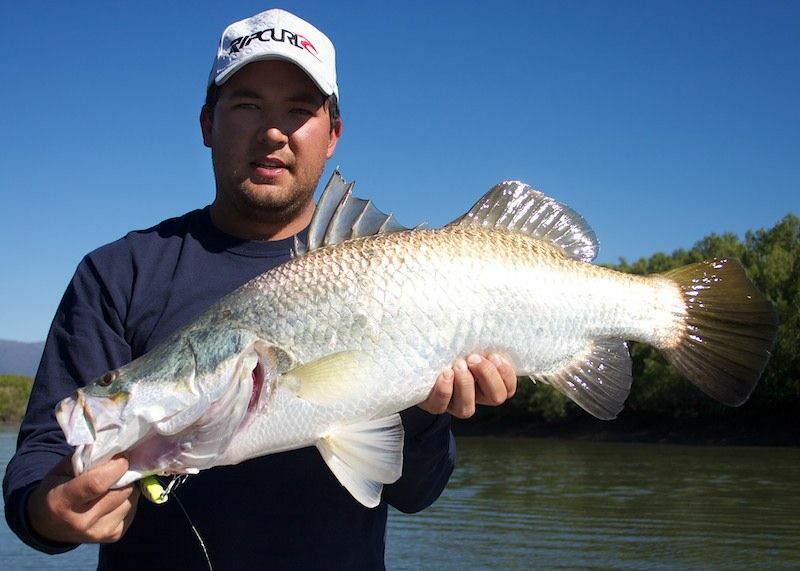 Then finally Jake puts his hard-body into some timber and the water explodes as a Barra launches itself from the water. This was a good fish and had Jake working hard to keep it from the timber. At one stage it took a run under the boat and jumped on the other side, leaving the braid a little worn in one section! But after some tense moments the fish was lead into the net. It measured 75cm and was happily release to fight another day. After this fish things went very quiet. So we headed toward the mouth to again try the threadybuster. The tide was almost bottoming out and very few snags remained in the water. We decided to work a deep (4-5m) section of channel along side one of the big sand bars. There was some broken ground and a little bait showing on the sounder. It was again a little slow going, but we managed 4 of 5 Grunter from the area. 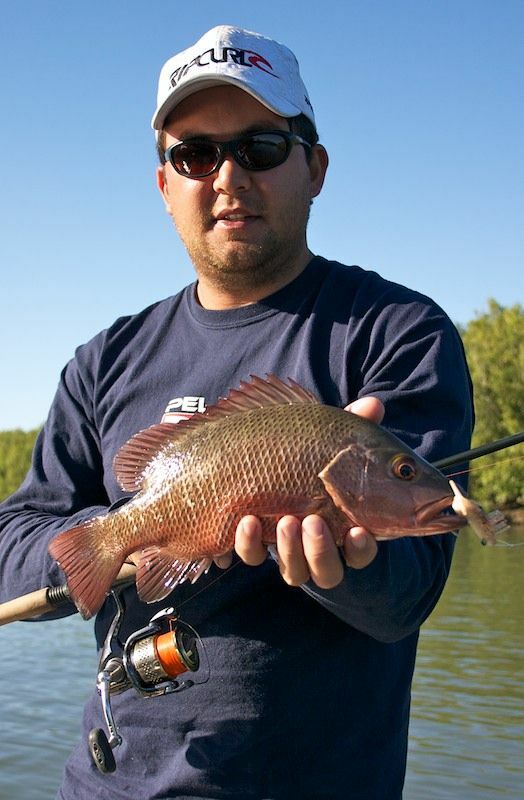 Most were small, but Jake nailed one well over the minimum legal size that was kept for dinner. Overall it was a consistent and rewarding day. 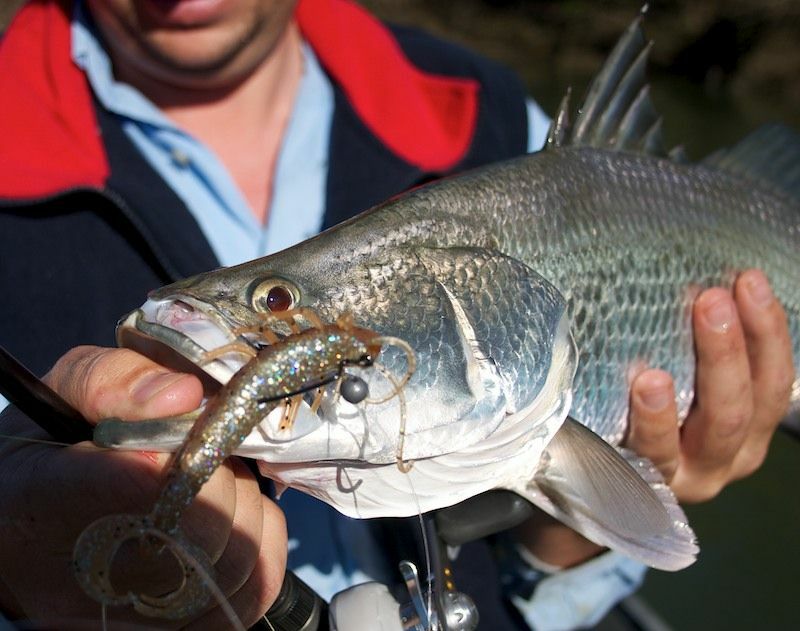 These threadybuster lures open up a whole new section of the creek to work as a lure caster. I know I will be heading into ProTackle this week to pick up a few for my tackle box. THREADYBUSTERS NOW IN STOCK AT PROTACKLE]!